Map It! Okinawa: "Nakandakari Hijya - A Natural Spring in Nanjo-shi"
"Nakandakari Hijya - A Natural Spring in Nanjo-shi"
This is the Nakandakari Hijya, or the Nakandakari Natural Spring. It's located in the town of Nakandakari, a small district in the Nanjo-shi region, which lies in the southern part of Okinawa. It serves as a water source for the local community. It is an old style spring with a heating stove affixed to the side to heat up water. 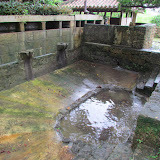 There is also an sacred place for prayer next to the spring. Here is a paraphrase of the English translation provided by the Tamagusuku Village Board of Education: The spring was once called 'Ufugaa' and was just an old wooden gutter. It was later rebuilt by a builder from the Tsuken Island between 1912-1913. It was used by the community for all sorts of chores; washing, cleaning, rinsing vegetables etc. Today, it is mainly for agriculture use for the nearby locals and farmers. 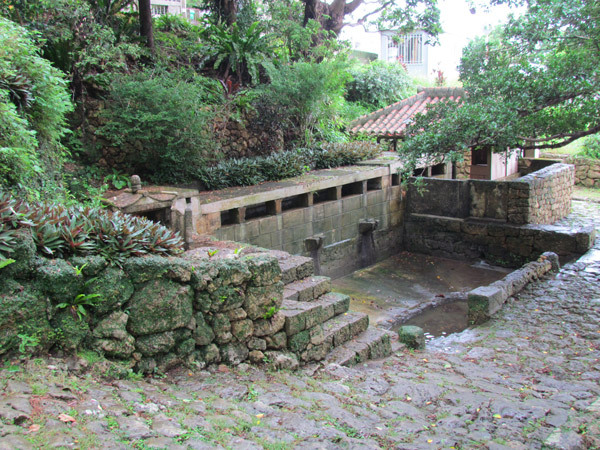 Unfortunately, the original spring construction was destroyed and subsequently buried during the Battle of Okinawa, but was later rebuilt to its original form in 2004 (end paraphrase). Note: There is a sign with both Japanese and English explaining the origin of this spring. I had assistance in helping find this place by Doc and Ryukyu Mike. They found it first and had posted earlier articles about it. If it were me, I would have driven past this place never knowing it existed. It is about a 100 meters near the main road (Highway 137). There is a small park with a cabana-like structure where you can view the coast line and the Philippine Sea to the east. Getting there. The spring is on Highway 137. Highway 331 runs into the 137 from the east side. I placed some landmarks to guide you in. Click on the Landmark Icon to see what they look like. The 'blue route' highlights how to get there once you turn off the 137. CAUTION. The ground next to the spring is either made up of limestone or coral. It is VERY SLIPPERY when wet. Use caution especially if you are walking up the incline to get an angular photo shot. Other areas of interest nearby. There are two castles that are not frequented by tourist but are very interesting. They are close to the 137 if you were to drive towards the west. I will 'Map' these castles some time this month, but just wanted to give you a heads up to the curious traveler if you wish to find them yourselves. To get a preview visit Mike's Ryukyu Gallery. He took some outstanding photos.